Wahama senior Tanner King, seated second from right, signed a letter of intent to play softball at West Virginia Tech on Nov. 14 at the Letart Community Building. 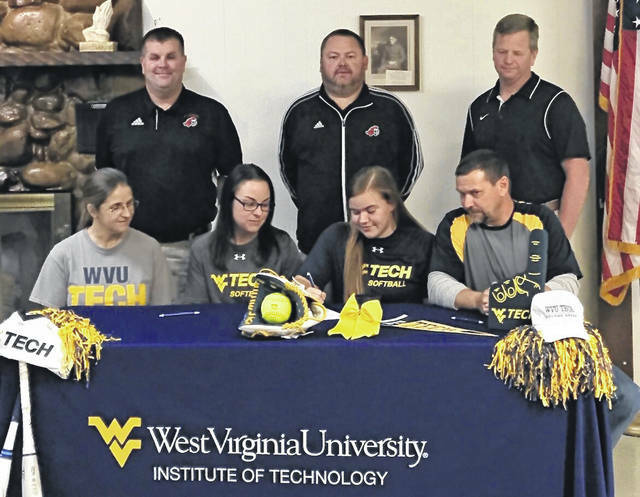 Tanner — who spent her first three years of high school at Point Pleasant — is joined by her mother Paula King, WVU Tech head softball coach Amber Affholter, and father Brian King at the table. Standing in back are PPHS athletic director Kent Price, PPHS softball coach James Higginbotham, and Jodie Roush. LETART, W.Va. — A lot of work went into this smile. Wahama senior Tanner King fulfilled a lifelong dream on Wednesday, Nov. 14, after signing a letter of intent to play softball at West Virginia University Institute of Technology in Beckley. 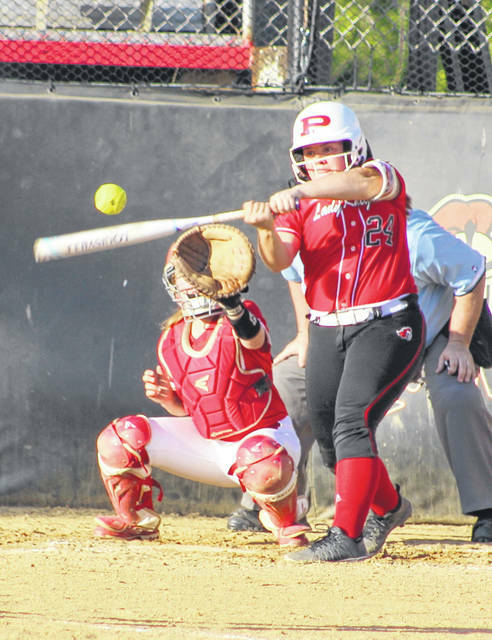 King — a two-year starting catcher and three-year letterwinner during her freshman through junior campaigns at Point Pleasant — is completing her senior season at Wahama before making the trek to join WVU Tech, a NAIA-affiliated school that competes within the River States Conference. King — a two-time Class AA honorable mention all-state selection — was very humble in speaking about this latest accomplishment in her softball career. As the senior noted, however, there were a lot of redeeming qualities about her visit to the campus … including the meeting with head coach Amber Affholter and some current members of the program. King knew, at that point, that she wanted to be a Golden Bear. “When I visited Tech, it felt like home. The softball team was super welcoming and helpful in any questions I had and I loved coach Affholter’s coaching style,” King said. “It’s also far enough from home to get away, but not so far I can’t come home when I want to or that my parents can’t make it to games. In her two seasons as the primary backstop, King batted .357 (65-of-182) with seven homers and 44 RBIs. King produced 21 extra-base hits, scored 16 runs and drew 25 walks while striking out only 18 times. Last year, as a junior, King hit .402 (37-of-92) and had four homers, 12 extra-base hits and 22 RBIs while drawing a team-high 14 walks. King also scored seven runs and struck out just eight times. All of those categories — except runs scored — were career-highs. From a competitive standpoint, King feels well-prepared to make the jump to the collegiate level. More importantly, the senior is thankful to have so many supportive people in her life — people who have helped make one young girl’s dream come true. “In my years at Point Pleasant, I’ve played in some big games with making it to regionals two of my three years. In those games, I played some of the elite players in the state and had some important at-bats and plays. I feel as if having the opportunity to step up in those big moments prepared me to play at the next level,” King said. “On the other side of that, playing travel ball has allowed me to play with many of the elite players in the state … and that has been a huge growing experience in itself. King currently owns a 4.217 grade-point average and plans to major in Mechanical Engineering while at WVU Tech. Tanner is the daughter of Brian and Paula King of Letart.